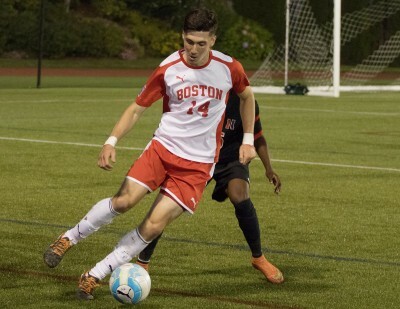 In its first of two consecutive Ivy League contests, the Boston University men’s soccer team fell to Princeton University 2-1 on Friday night in a matchup at Roberts Stadium in Princeton, New Jersey. The Terriers (2-2) began this season with a 3-2 loss at No. 15 Boston College on Aug. 28, but had rattled off a pair of wins before Friday night’s defeat. The loss to the Tigers (2-2) was especially tough for BU head coach Neil Roberts’ team, which was starting to look like it had found its identity. BU came out of the opening kickoff with great offensive tenacity, firing 10 of the game’s first 12 shots. It was the Terriers who got on the board first in the 32nd minute thanks to the skill of undersized midfielder Magnus Benediktsson. The sophomore out of Iceland, who already held the team lead in assists, netted his first career goal for the Terriers to put them up 1-0. The goal was assisted by junior midfielder Anthony Viteri, the reigning Patriot League Player of the Week. Viteri, who currently holds the team lead in points with seven, won a battle for the ball on the sideline and passed it up to Benediktsson for the score. The lead didn’t last long though, as the Tigers knotted the score at one just over three minutes later. In the 35th minute, defender Mark Romanowski kicked the ball into the box for freshman Benjamin Martin, who headed to ball to midfielder Vikram Pothuri for the equalizer. The second half was much of the same, with the Terriers putting five shots on goal compared to the Tigers’ four. In the 56th minute, Martin notched his second goal of the year and the one that would prove to be the game-winner. It’s a quick turnaround for Roberts’ squad, as BU gets set to face its second straight Ivy League foe with a matchup at home this Tuesday versus Brown University. After Brown, the Terriers will begin their Patriot League slate, starting with a matchup at Bucknell University this weekend. Roberts hopes that his team will continue to find its way on both ends of the ball leading up to that contest.